Fifth graders can learn so much! Abeka's engaging curriculum, built on a solid Christian worldview, will guide your students through the Eastern Hemisphere, their first research paper, pre-algebra concepts, and much more! 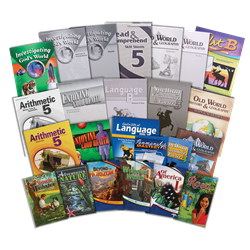 The Grade 5 Student Kit contains all essential textbooks and coordinated materials, including assessments, for an entire year of schooling in language arts, arithmetic, science, health, and history—24 items total. Combine this kit with the Grade 5 Teacher Kit, and you can confidently teach and guide your fifth graders to academic excellence. Reading—Reading from classics, modern stories, and poetry gives your students a window on their world and presents them with Christian ideals and spiritual values. All that plus increased reading comprehension and vocabulary development! Grammar and Composition and Penmanship—Fifth graders learn to use their language naturally from the useful, practical way that grammar is taught in conjunction with composition, research, and oral usage. Daily penmanship practice begins with a review of “trouble-maker” formations and then graduates into creative writing and journal entries. Spelling, Vocabulary, and Poetry—A straightforward teach/practice/test approach makes spelling “second nature” to your young writers. The interesting weekly lists cover such topics as home, French words, food, and more. Your students will also learn to spell, define, and use 10–20 vocabulary words in each lesson. And what an accomplishment when they can recite from memory all 6 poems! Arithmetic—Challenge your students with decimals, more advanced word problems, and basic geometry, all taught step-by-step. As in the other skills subjects, the Abeka program ensures repetition and maintenance of basic skills and builds a foundation of understanding necessary for more abstract concepts. Science/Health—Your students will learn all about the mysteries around them—worlds of plants and animals and insects. In the 7-week Health course, fifth graders learn about the intricate design of their bodies, that most marvelous creation of God. History—The 300 colorful pictures illustrate the journey from the beginning of recorded history to the present. Along the way, your students will meet explorers and leaders and missionaries. Told from a Christian perspective and combined with geography and map activities. Art—Stimulate creativity and art appreciation with the 37 projects within Art B. Direct your students in the techniques of drawing, shading, painting, and more.